Rhizome | Blog Posts tagged "Oulipo"
Harry Burke | Mon Mar 30th, 2015 8 a.m.
Part of First Look: Poetry as Practice, copresented with the New Museum. R Minus Seven (2015) by Melissa Broder (@melissabroder) is a collection of ekphrastic poetry that was written in response to Oneohtrix Point Never's album R Plus Seven (Warp Records, 2013). 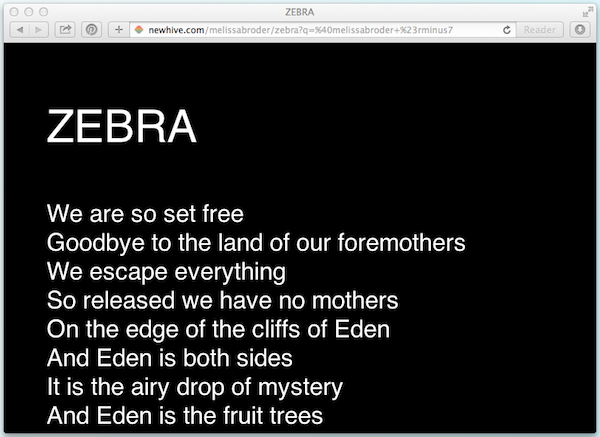 Each of Broder's poems is presented in a layout designed by the poet on the online publishing platform NewHive. Melissa Broder is the author of three collections of poems, most recently SCARECRONE (Publishing Genius Press, 2014). Her poems have appeared or are forthcoming in POETRY, Tin House, the Iowa Review, Fence, the Missouri Review, Denver Quarterly, and Guernica, among others.